I first saw this book across a crowded trade floor, the TARDIS blue caught my eye and the large square padded format guided me in. Then I opened the book and fell in love. The BBC is currently celebrating the 50 years since the first episode of Doctor Who was aired. There are many introductory books out there now for those of you who have seen a few episodes and want to know a bit more, but this is not one of them. 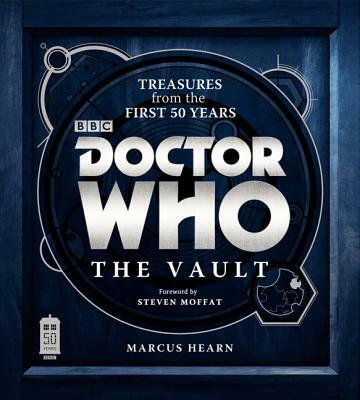 Doctor Who: The Vault is an official guide, making full use of the BBC archives and most importantly, it's a book for Doctor Who fans. The book is arranged year by year, with hundreds of high quality color production photographs, concept drawings, design sketches, models and close ups of props and memorabilia. I have been watching Doctor Who for 30 years and there was plenty in this book I'd never seen before. There is also plenty to read, lots of interviews and stories that span even the years when no tv episodes were made. I'm not saying you need to have seen all the episodes (actually you can't watch all of them, many of the original recordings are lost or badly degraded), but if you get excited when there's a new episode, you know your Zygons from your Autons and you have a healthy respect for the show's incredible history, then this is what you want for your Birthday.